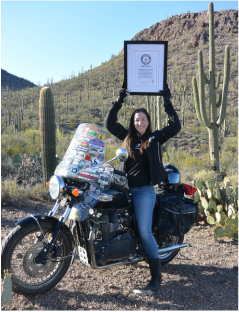 Guinness World Record Rider-Danell Lynn--The Journeys are vast and continue - Find more details​ from the expeditions on the Blog! They begin in Prudhoe Bay Alaska-summer 2016. The Northern most terminus of the Pan-American highway opens to 25,000 miles of excitement for three riders and a film crew who seek to power past the challenges of the road in the name of adventure and advancement in green technology on electric motorcycles down to the southernmost city in the world- Ushuaia, Argentina. Danell Lynn is the couturier for Dl-Couture fashion house and designer of Humani Handbags...an author, philanthropist, world traveler...and she rides...welcome to the adventures.